Out on the water with Essex Land Trust. 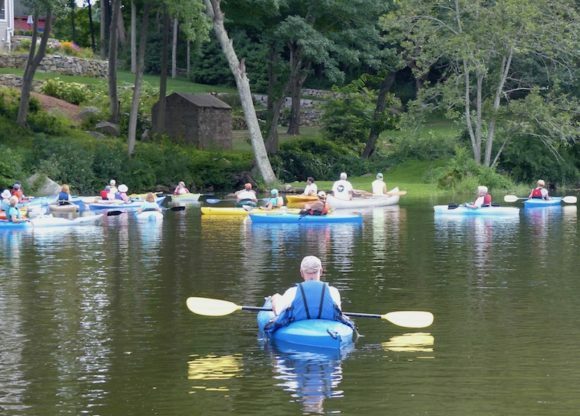 ESSEX — The Essex Land Trust invites you to explore Essex’s North Cove and Falls River on Saturday, June 10, 2 pm, with registration starting at 1:30 p.m. Bring your own boat for an early summer kayak/canoe trip into peaceful North Cove and Falls River. Join naturalist Phil Miller as he speaks about the abundant wildlife and history of this waterway where many of Essex’s colonial ships were built. North Cove is a 230-acre body of tidal water between the Falls River and the Connecticut River. The cove is formed in part by Great Meadow, a 200-acre “pendant bar”, or levee, along the Connecticut River. North Cove is part of the Connecticut River Estuary Canoe/Kayak Trail. North Cove was noted for shipbuilding, with the Mack and Williams yards turning out coasting vessels in the 19th century. Empty now, Great Meadow was a beehive of activity, too. Cattle were grazed, salt hay harvested and duck hunting blinds once lined the shore. The bar was also a base for the local shad fishing industry. Great Meadow is topped by cattails and reeds while wild rice and bulrush grow at the water’s edge. Rare plants include horned pondweed and tidewater arrowhead. A well-known eagle habitat, the cove and meadow also attract ospreys, hawks, red-wing blackbirds, goldfinches and swallows. Meet at the public boat launch, foot of Bushnell St., off of No. Main St Participants should register on site beginning at 1:30 p.m. and launch their boats prior to the 2 p.m. departure. A safety boat will accompany. Bad weather cancels.